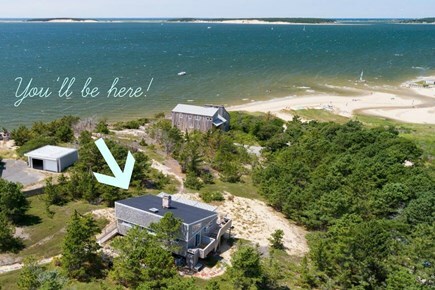 This beautiful Wellfleet home with breathtaking water views is located on a quiet private road just 3 minutes from a private beach on Cape Cod Bay. The house accommodates extended/multi families with ease with 4 bedrooms and 2 1/2 baths. Enjoy central AC/heat, a working fireplace, unobstructed views through floor-to-ceiling windows, an expansive deck, and ample outdoor parking and play areas. 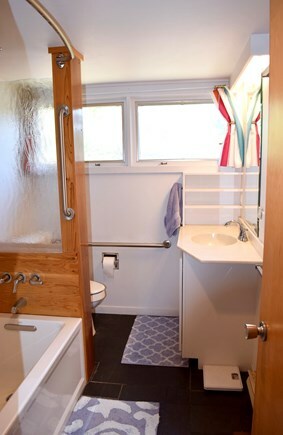 Also, a dishwasher, washer/dryer, cable TV, Internet, a BBQ grill, and an outdoor shower. 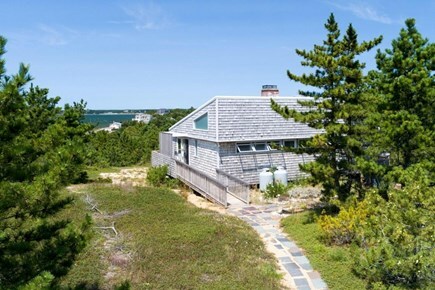 Charlie Zehnder — dubbed ''the most prolific modern architect on the Cape'' — designed our house in 1971, and generations of our family have grown up here. Spend your vacation relaxing in our beautiful, tranquil home. We know you'll love it just as much as we do! Enter the house on the main floor, where you'll find the living room, dining room, and kitchen. The spacious open floor plan allows everyone to carve out their own nook while still feeling connected. Down the hall are two master bedrooms — one with a balcony overlooking the yard — as well as a marble-tiled full bathroom. All common spaces feature floor-to-ceiling windows and sliding glass doors, maximizing the natural light and ensuring perfect beach views all day. Two more bedrooms — each outfitted with two twin beds — are downstairs. With floor-to-ceiling windows and sliding glass doors, each room gets plenty of natural light and opens up onto the sandy yard. You'll find a second full bathroom, a linen closet, our impressive puzzle collection, and a toy closet for kids. 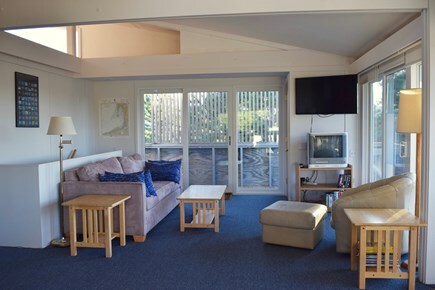 There's also a basement room with a washer and dryer, utility sink, and beach necessities (chairs, boogie boards/bodyboards, and more). The downstairs bedrooms are ideal for kids or additional guests. 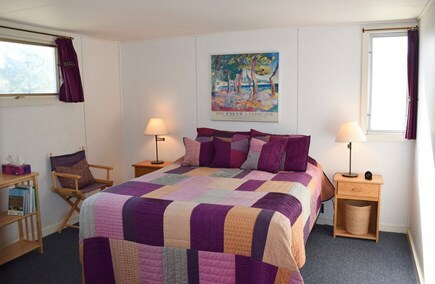 Each bedroom contains one extra long twin bed for extra tall friends. 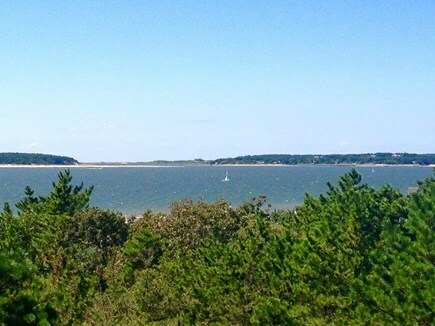 Enjoy quintessential, tranquil Cape Cod in the Indian Neck neighborhood, overlooking the Cape Cod Bay. Located at the end of a private road, the area is quiet, peaceful, and safe. Explore our herb garden, read or entertain guests on our huge deck (runs the full length of the house), or stroll down to our private beach (just steps away). There's lots of room for kids to play outside in the sun and shade, plus 2-4 cars can park comfortably. Kitchen: we love to cook! You'll find all the cookware, dishes, glasses, cutlery, and serving pieces you could want, plus an herb garden, two large tubs of fresh herbs on the deck, and dry spices in the pantry cupboard. Charcoal grill on deck right outside the kitchen. For kids: highchair, books, board games, puzzles, toy closet downstairs for young children. Additional availability info: Long weekends available in fall (Columbus Day, OysterFest, Thanksgiving, etc). Inquire for details. This is a Saturday to Saturday vacation rental. Additional pricing info: Pricing includes end-of-stay professional cleaning. State and local taxes of 12.45% will apply. A new grandchild and our 50th wedding anniversary prompted our family vacation in Wellfleet. We found this house online and saw immediately that it would meet our needs - upstairs for the oldsters and daughter, downstairs for the son, wife, two year old and newborn. The house turned out to be perfect in the following obvious ways, all visible in the online photos: a secluded location; a fabulous view and an enormous deck to enjoy it; a well-equipped kitchen with up-to-date appliances, comfortable seating and dining indoors and out; cushions for the outdoor deck furniture were a plus! and the great outdoor shower and herb garden. Thank you, Joan, for your thorough and very generous review! I'm delighted that you and your family had such a wonderful time, especially since you were celebrating such important milestones together. My family spends as much time as we can at the house. We know all the amenities that make our own lives fun, comfortable, and relaxing so of course we want to provide the same experience for our tenants. I hope you'll keep our home in mind for the future; we'd love to welcome you back anytime! Thanks for the feedback, Nick; I'm delighted that your extended family had such a wonderful time at the house. Alas, we do not have a direct walkway or stairs to the beach, thus our home is listed as water view rather than waterfront. I'm glad your family enjoyed their time nonetheless (and I suspect that being just a year older will make the path down to the beach much easier for your granddaughters to conquer). I certainly hope you'll come back next year--you're welcome anytime! Adrienne, thank you for your thorough description of the house and lovely compliments! ("Awww shucks" says our blushing house manager.) We hope you'll return soon to bask in more magnificent sunsets; you're welcome anytime. We're honored to be your favorite spot, Kate, and hope you'll return for years to come! We love our house's unique and striking architecture, glad to hear you appreciate it too. Please continue to enjoy the games, books, and movies; they're there for you to use. We recently organized the bookshelves and even added some new titles, so you'll have to come back and check them out soon! 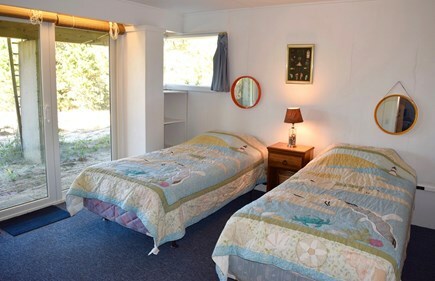 In full disclosure, I have been vacationing at this property my entire life, spending my summers walking to the small bay that lays adjacent to play by the beach; and now that it is available to the public for rental, I could not be more excited for you, a prospective renter. 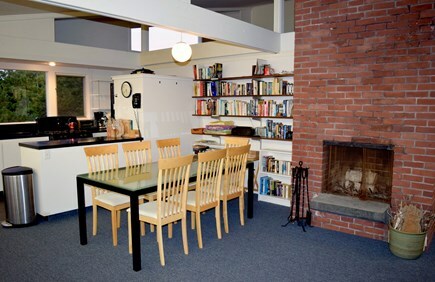 With the caveat that one have access to a car, for it is rather far removed for anything less, this property is perfect for a family that wants to travel en masse or a group of friends that want to share the cost for a large space that can easily accommodate 8 adults and additional children. Thank you for your incredibly kind words, Alan; you're welcome to come back any time! You're right that a car is essential most places on the Cape, unless you're an avid cyclist. Thanks for pointing that out. So glad you enjoyed your stay, Leslie! You're welcome to return anytime for more seal watching and/or reclining on the deck with a good book and a cold beverage. We really enjoyed our visit to this lovely home. Views of the bay and Great Island are ever changing and the sunsets not to be missed. The house is well equipped, airy, and a great place to hang out in good or bad weather. Easy walk to the beach. The hosts were easy to communicate with and helpful. We highly recommend this home and will definitely return. Charming, cozy, and the best view! I had the loveliest visit in this gorgeous home. My friends and I stayed for a few days, cooking in the sweet kitchen, relaxing and partaking in the sunsets on the porch, taking the short walk to the beach, and much more. 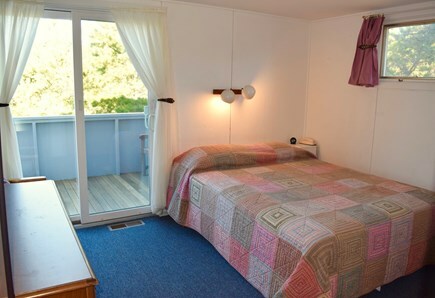 Would highly recommend to a family or a group of friends looking for a marvelous place to stay on Cape Cod! Thanks for sharing, Miriam! Our family loves to cook and takes great care to stock the kitchen with all the equipment, dishes, and utensils one could want, so we're always delighted to hear that tenants enjoy cooking there as much as we do. Hope you and your friends will come back soon! This house has neat architecture with open spaces in the common areas. 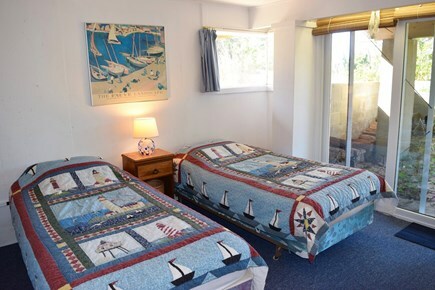 Bedrooms are nice and are fine for two people per room. This house is great for two families of four. 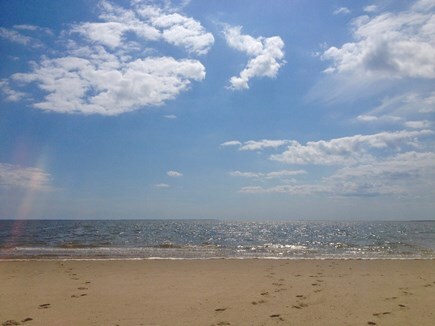 Wellfleet is an amazing place and has fun activities, beautiful beaches, and great views in all directions. We also went to Provincetown (only 20 minutes away) and had an amazing whale watch with the Dlphin Fleet. The rental experience was easy and convenient. We plan to return in the future. Thanks for your kind feedback, Leo! Happy to hear you're a fan of the house's cool, unique Zehnder architecture (which provides lots of space for extended families, as you rightly pointed out). We hope you'll come back soon to enjoy more beach time and whale watch expeditions with friends and family of all ages! We absolutely loved staying here! 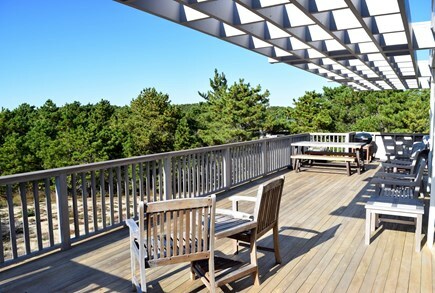 The spacious deck is perfect for viewing sunsets over Wellfleet Harbor. Breathtaking view of Great Island - which is a wonderful place to take a picnic and to enjoy a seaside walk. The deck is also ideal for sharing a leisurely breakfast and then taking a stroll to the beach, which is a very short walking distance. So glad you enjoyed your time at the house, Leila! We hope you'll keep coming back. Thanks for sharing info about all the great biking and hiking/walking trails nearby. I'm proud to be the House Manager of what truly is a family home. 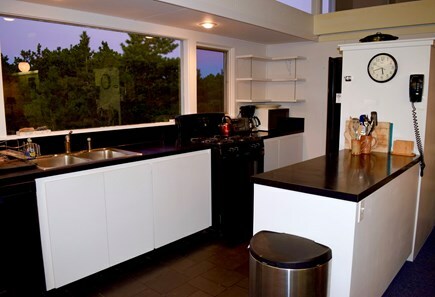 My grandparents commissioned Charlie Zehnder — dubbed ''the most prolific modern architect on the Cape'' — to design the house and my grandmother built it in 1971. The house has been a delight for generations since, with siblings, cousins, and grandkids all growing up here. I've moved around frequently throughout my life, but summers at the Cape have always been a constant. I take pleasure in sharing our house with friends, extended family, and you too. Come spend a week or two (or more) and see why my family keeps coming back year after year. We have the best sunset views around. 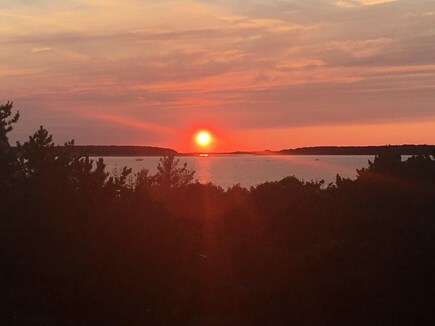 I've been coming to the Cape for almost three decades and while I love the gorgeous beaches and waterfront dining, nothing beats reclining on our deck with a cold beverage and watching the sun set over Great Island and the bay. Well, maybe the sky on a clear night. Tucked away at the end of a private road, there's very little light pollution at night, so you can take in all the constellations and discern the Milky Way above.